Japanese superstar Hotei has just released the video for his new single ‘Walking Through The Night’, which features the iconic Iggy Pop on vocals. 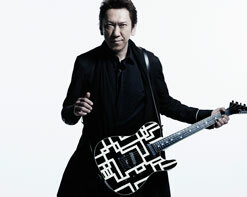 2016 marks Hotei’s 35th anniversary in music and to celebrate this milestone, Hotei has been touring Japan extensively including over 50 live dates ranging from intimate club shows, to a free open-air concert in his hometown in front of 25,000 fans and will be ending the year with his 31st performance at the Budokan in Tokyo on December 30th, with a very special fan request show. “Strangers In The Night” is taken from the album Strangers, which was released last year through Spinefarm Records and is Hotei’s first international release. The album features an array of guests including Emigrate/Rammstein’s Richard Z. Kruspe (who lent vocals on the ferocious video for “Move It”), Bullet For My Valentine’s Matt Tuck, Noko from UK electronic band pioneers Apollo 440, and acclaimed Texan singer Shea Seger, alongside the godfather of punk, Iggy Pop. The “Strangers In The Night” video follows a man’s nocturnal journey through the seedy back streets of Tokyo, lured by the bright lights of temptation. Stunningly filmed and featuring shots of Iggy Pop and footage of Hotei, the video is a gloriously evocative taste of Hotei’s homeland that chimes with the snarling lyrics. We are all incredibly excited to be working with Hotei and the Reybee, Inc. team to bring you this legendary artist. We would love to get you a copy of Strangers for your listening enjoyment, so please don’t hesitate to get in touch with us here at HIP Video Promo. Please contact Andy Gesner and the HIP Video Promo team at (732)-613-1779, email us at info@HIPVideoPromo.com. You can also visit www.SpineFarmRecords.com/uk or www.Reybee.com for more info on Hotei.